The Question:I’m constantly sending files to colleagues and would like to compress them to save space. I know that Windows 8 has support for compressed files, but how do I use them? 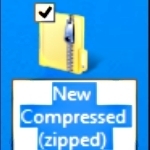 I’ll demonstrate how to create a compressed folder, but it’s a bit hard to understand what it’s doing: the system presents it as if it’s just a regular data folder, but as you add things, they’re automatically being compressed, and if you attach the folder to an email, for example, it’s actually a file itself with the “.zip” suffix. Weird.